KUALA LUMPUR (Sept 16): While there is no regulation on short-term tenants such as Airbnb, Endah Promenade management corporation (MC) chairman Siew Yee Hoong advised operators to get approval from their property’s management body. “Whether you agree or not, you can raise your views at the annual general meeting or extraordinary general meeting within your community. For me, I believe it has nothing to do with whether short-term tenancies are okay or not okay — it depends on the location and situation. 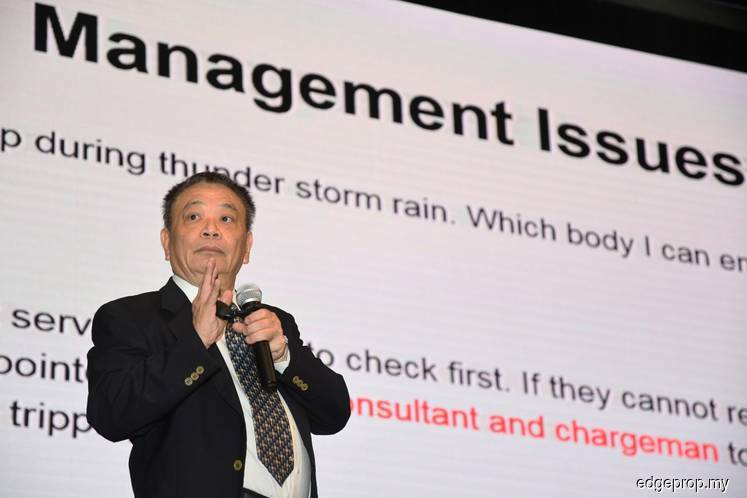 For example, it seems okay in Port Dickson but not so okay in Bangsar,” said Siew in the Malaysian Institute of Professional Property Managers’ free public forum titled “Strata Living in Harmony” this morning in Sunway Putra Hotel. He said even if the majority has agreed that unit owners can have short-term tenants, the management body should set conditions to protect the benefits of the residents. “In my opinion, I think the operator need to register with the management office, limiting the number of persons and impose a security deposit should there be damage on the asset of the common property,” Siew noted. In response to the question about how to recover funds from defaulters, he believes that engagement sometimes is more helpful than taking legal action. “I have experience in this issue as I’m the chairman of an MC. Instead of issuing a notice and take them to Tribunal, I usually will see them in person and see what can I do before taking the matter to a more serious stage. I realise it is more helpful to engage the community and, of course, the MC has to do their work so residents will not have any excuse to not pay their fees,” he shared. Siew is one of the six panellists of the event. The other speakers are Burgess Rawson Malaysia managing director Wong Kok Soo; Kuala Lumpur City Council commissioner of buildings (COB) sector head Haji Kamarulzaman Mat Salleh; Petaling Jaya City Council COB head Nor Shabani Johari; Ministry of Urban Wellbeing, Housing and Local Government senior federal counsel and head of legal and claims division Roshan Kshatriya; and lawyer Girubaharan Retnasigamany. The event is supported by EdgeProp.my, who is also the exclusive media partner of this forum.